You can use the right side menu in order to explore the portal. Links e CMCC together with all related data providers informs that timely delivery of data and products from this server through the Internet is not guaranteed. 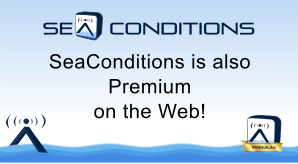 The information on Sea Conditions Web pages may be used for any lawful purpose so long as you do not: 1) claim it is your own, 2) use it in a manner that implies an endorsement or affiliation with the Links/CMCC, or 3) modify its content and then present it as official Sea Conditionsmaterial. The user assumes the entire risk related to the use of information on Sea ConditionsWeb pages. Sea Conditions provides such information "as is," and Links/CMCC disclaims any and all warranties, whether express or implied, including (without limitation) any implied warranties of merchantability or fitness for a particular purpose. In no event will Links/CMCC be liable to you or to any third party for any direct, indirect, incidental, consequential, special or exemplary damages or lost profit resulting from any use or misuse of this data. Sea level shown within the panel is the resultant of the effects of several natural phenomena (like the astronomical tide, atmospheric pressure, wind, temperature, salinity and wave set-up) upon the sea surface. At this zoom level you are displaying more detailed forecast data for Adriatic Sea, Tyrrenian Sea and Sicily Strait regions. For that reason you could experienced discontinuities in forecast at the boundaries with the rest of the Mediterranean Sea. The cloud cover prevents the acquisition of measurement data from the satellite. * You need to restart the web page.